Anyone who is starting to build their own home studio knows that an audio interface is a must when running different midi or vocal channels. A good quality audio interface can make a huge difference in your sound by sending the track through the appropriate channel, giving your instrument it’s own stand-out quality on your track. After purchasing two mid-level audio interfaces (Apogee Qurtet ) I decided I would trade 4 inputs for just 2 if it meant I could have easy-to-use equipment and software that nearly guaranteed the highest quality. I decided to purchase the “Apple-equivalent” company and splurged for the Apogee. When I say Apple-equivalent I mean the following: 1. simple & intuitive interface, software, and manual. 2. high-quality 3. sleek design. 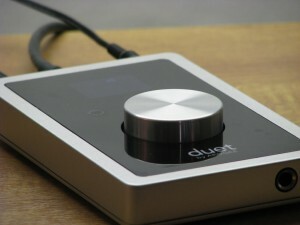 I’m using a i7 Mac desktop running LogicPro X . I plugged in the Apogee Duet and Logic recognized the Duet immediately. I spent the next 10 minutes figuring out the correct/desired settings within the Apogee Software using the help of other users after Googling “Apogee and Logic” etc. Within 20 minutes of opening the Apogee Box I was up and recording in stereo with ease. This is a perfect out of the box audio interface to set up for home studio beginners trying to get their music taken seriously by those in the industry. Revolutionary New Music Software Click Here!